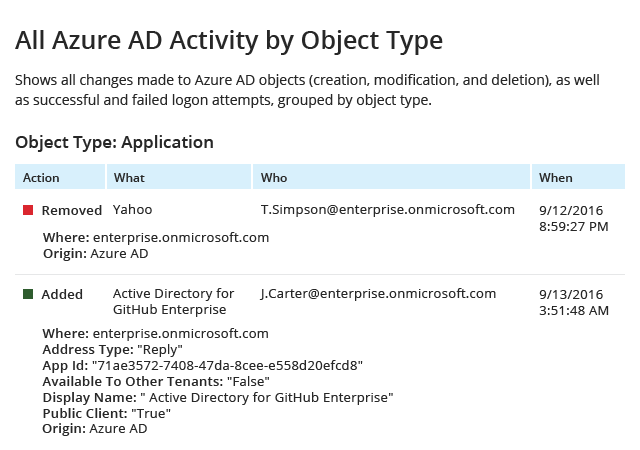 An Azure AD monitoring application that provides deep insight into changes made to Azure AD objects, object properties and permission settings, and helps you stay in control of user sign-ins. It is a part of the unified Netwrix Auditor visibility platform for user behavior analysis and risk mitigation in hybrid IT environments. 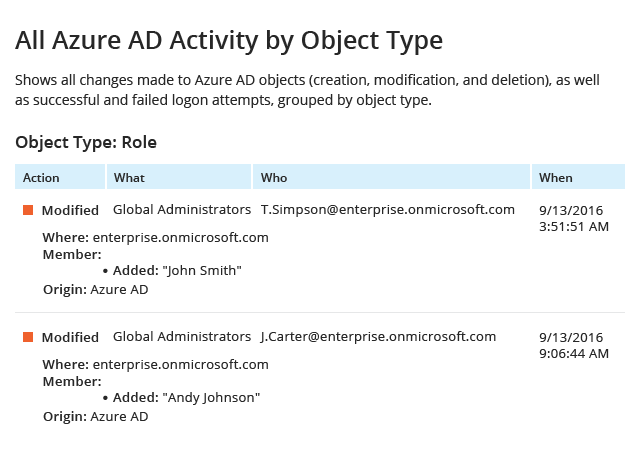 Advanced Azure AD reporting capabilities enable you to keep track of changes made to Azure AD groups, users, user passwords, directory roles, applications, service principals, devices, contacts and more. 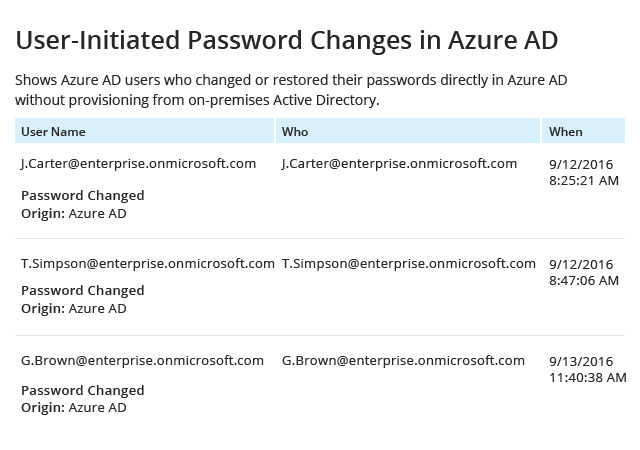 You can also track and report on both successful and failed sign-in attempts with full details, including client name and client IP address. and with that have been able to provide a better user experience." How do you get the details on an incident that lies in the distant past, such as a directory role change that occurred seven months ago? Or how do you find the root cause for a user being unable to access a web application? 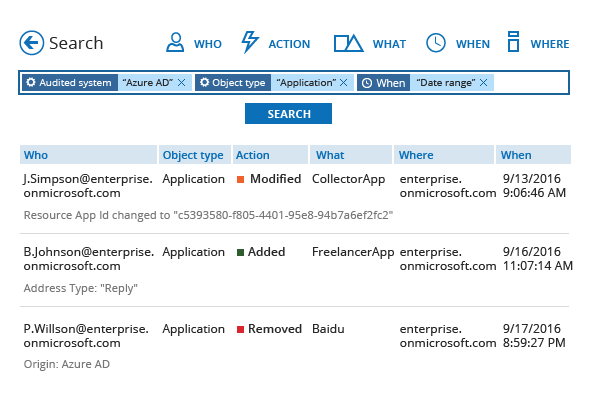 The Interactive Search surpasses native Azure AD reporting capabilities by enabling you to specify your own search criteria, apply multiple built-in filters and quickly retrieve exactly the detailed audit records you need, making investigations and troubleshooting more efficient. 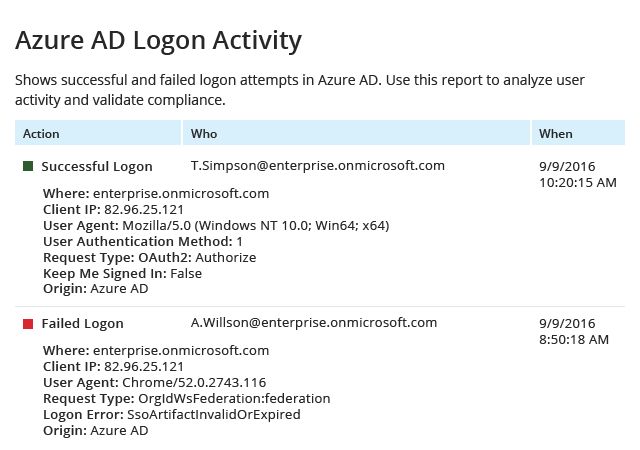 Use easy-to-read audit reports to see complete details about a change in Azure AD, even if it occurred a long time ago. 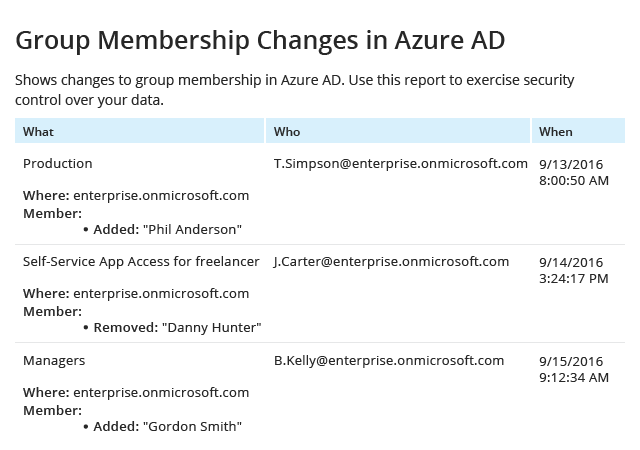 Stay aware whenever someone adds a member to a group, deletes an application, modifies a user account or performs another action that might otherwise slip under your radar. 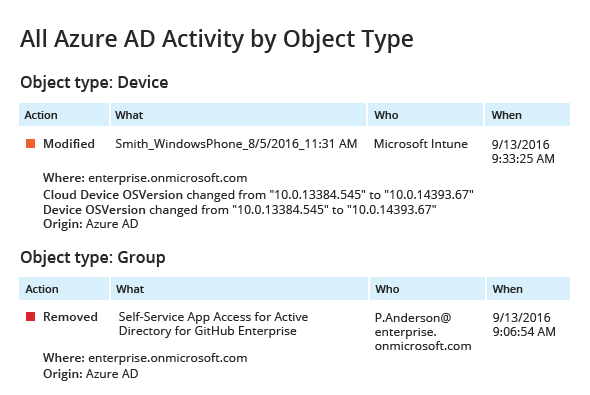 Use Overview dashboards for continuous Azure AD monitoring and be first to know when something unusual occurs. 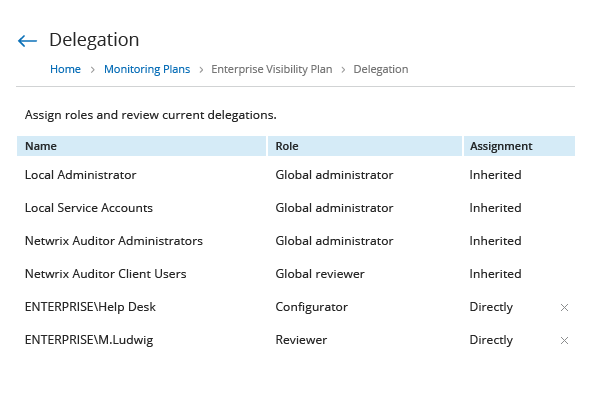 Easy-to-use reports and dashboards include filtering, sorting, exporting and subscription options. Be the first to know about events that could jeopardize the security of your environment with alerts on threat patterns. 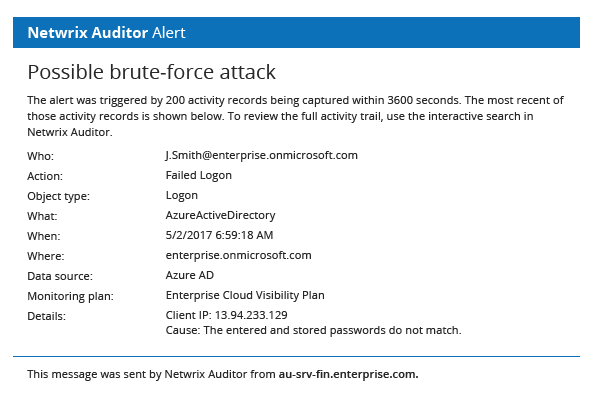 For instance, a spike in failed attempts to sign in into your Azure AD could indicate a brute-force attack in progress. Fine-tune the alerts to meet your specific needs. Spend less time validating your information security controls and simplify communication with external auditors using out-of-the-box compliance reports mapped to the specific provisions of PCI DSS, HIPAA, SOX, GLBA, FISMA/NIST, CJIS, GDPR and other compliance regulations. 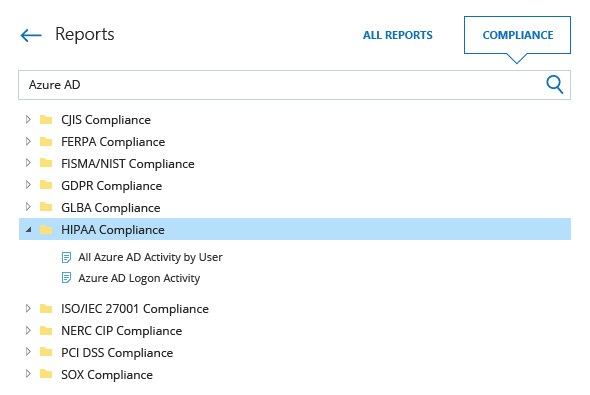 Unlike Azure AD's native audit logging capabilities, Netwrix Auditor for Azure AD ensures audit trails are reliably preserved for many years, while also enabling easy, anytime access to any historical details requested by auditors or needed for internal security investigators. A two-tiered storage architecture (SQL database + file-based) ensures cost-efficiency. 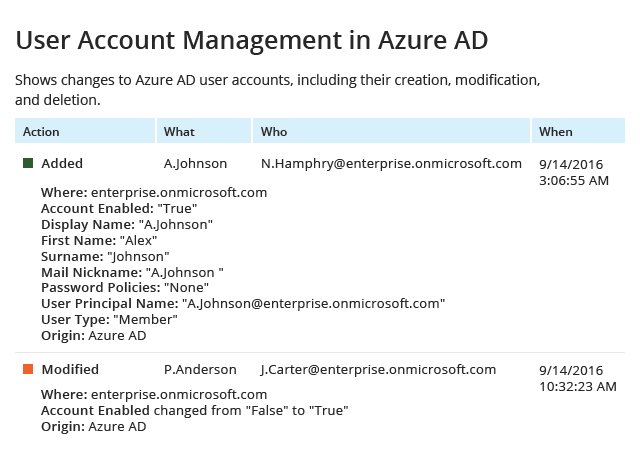 Worry no more that the wrong people can interfere in your Azure AD reporting and auditing processes. 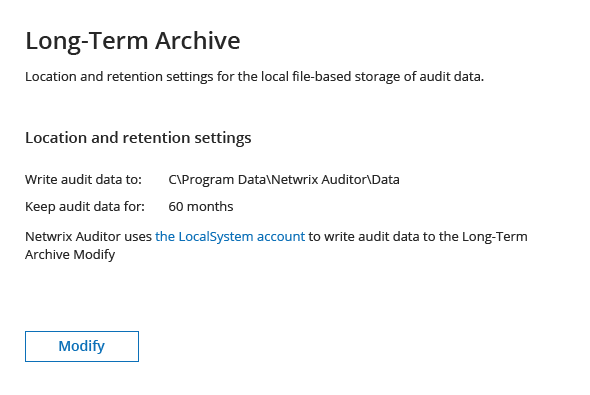 Granularly control the ability to configure audit and view Netwrix Auditor’s security intelligence in accordance with the scope of each person’s duties, from system administrators to department managers to C-level executives. Plus, you can easily subscribe anyone to the reports they need to keep them informed automatically. "Netwrix Auditor helped us solve a very specific auditing task that we could not perform easily with any other tool available. After installing Netwrix Auditor, we discovered the great range of data we can gather from our environment, which has opened our eyes for further possibilities of the software. We keep finding new ways of using Netwrix Auditor." Deploy Netwrix Auditor from the Microsoft Azure or AWS marketplaces and get up and running with auditing in just minutes.